Over the past weekend, a massive heavyweight boxing contest went down in California. 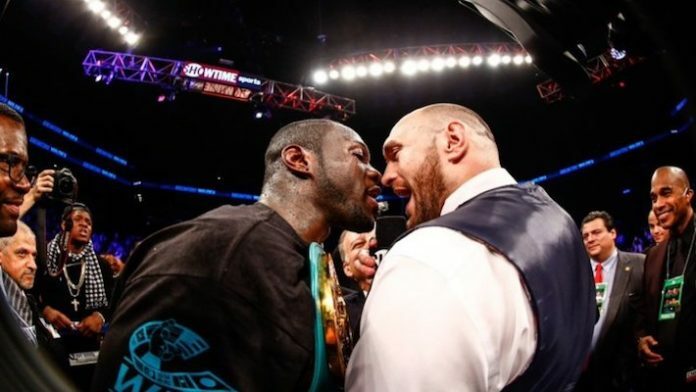 WBC heavyweight champion Deontay Wilder defended his strap against lineal heavyweight champion Tyson Fury inside Los Angeles’ Staples Center. The fight went all 12 rounds, however, the judges turned in a controversial decision. The overall consensus from the boxing community was that Fury outboxed Wilder throughout the fight. However, Wilder scored the only two knockdowns of the fight, the latter arguably rendering Fury unconscious. Despite the second horrific knockdown, Fury rose to his feet and was able to continue the fight. When it was all said and done, a split decision draw was read from the judges’ scores. A rematch is likely to go down next, with the winner chomping at the bit to face heavyweight king Anthony Joshua. While many believe Fury should’ve gotten the nod on the judges’ scorecards, there’s also the argument that Wilder should’ve won via knockout. In the 12th round, Wilder landed a combination that sent Fury flying down hard, looking to be unconscious. Miraculously he was able to get to his feet and finish. “We seen what he could do, what he was able to do, especially with that get-up,” Wilder said. “That still surprises me. I seen this guy’s eyes roll slowly in the back of his head. And many people felt that should’ve been waved off. Nine out of 10 refs would’ve waved that off. “I’ve seen many times where they’ve done waved that off. Look at my brother, Malik Scott, when he fought Dereck Chisora. Malik was on his knees at nine, stood up at 10 and they waved it off immediately. I felt like the count was very slow. I felt like there was a lot of delays in there. “But I’m not gonna complain, because we put the heavyweight division on notice, and we did it with me and Fury. It’s not about no other guys or nothing like that. Me and Fury did it like true champions. We came together, we conversated amongst each other and we got this fight done, without involving all the other extra stuff. What do you think about Wilder saying the referee should’ve waved the knockdown off?